The findings enhance scientists’ understanding of the forces driving alertness, a brain state that’s essential to survival, by showing that diverse cell types throughout the brain together produce this state. The researchers employed a cutting-edge technology that allowed them to monitor vast numbers of nerve cells’ activity in the brain simultaneously and, afterward, to characterize the cells of interest in molecular detail. This new method lets scientists record the activity of any cell type, without needing to produce special, genetically modified animals for each new experiment. In a study published online Nov. 2 in Cell, Karl Deisseroth, a Howard Hughes Medical Institute Investigator and professor of bioengineering and of psychiatry and behavioral sciences at Stanford, and his colleagues describe how they managed to observe activity in nearly every nerve cell, or neuron, in the brains of larval zebrafish while tracking the creatures’ reaction times in response to a stimulus. (Studies in humans and other animals have shown that reaction times are faster when the subject is more alert). The activity of each neuron was then linked to that neuron’s particular cell type. With this brain-wide dragnet, Deisseroth and his associates were able to determine the identities of several distinct neuronal circuits not previously suspected to be associated with alertness. The study’s lead author is postdoctoral scholar Matthew Lovett-Barron, PhD. Importantly, the researchers extended their findings to mice, confirming that the same circuits tied to alertness in zebrafish are acting similarly in mammals, whose ancestors split from those of zebrafish hundreds of millions of years ago. “This tight conservation of alertness-promoting circuits over such long epochs of evolutionary time — longer than human and mouse lineages have been separated — strongly implies relevance to humans as well,” said Deisseroth, who holds the D.H. Chen Professorship. The Stanford scientists call the new method they developed MultiMAP, which is short for Multiplexed-alignment of Molecular and Activity Phenotypes. It let them track the activity of nearly every neuron in the zebrafish brain and then identify the cell type of every neuron of interest - the crucial step in determining which neuronal circuits are participating in the induction of a brain state such as alertness. In particular, the investigators wanted to explore the activity of the brain’s neuromodulatory circuitry. Distinct from their more binary cousins — some 98 percent of neurons in the brain act by either exciting or inhibiting downstream nerve cells — clusters of neuromodulatory neurons send out projections that branch throughout the brain and act less like on/off switches than like colors on an artist’s palate. Rather than excite or inhibit, they instead add nuance by secreting substances that render excitatory and inhibitory neurons more or less likely to fire under various circumstances. The zebrafish Deisseroth’s group looked at were only 7-10 days old — a time when their bodies are only a few millimeters in length and still relatively transparent, yet are able to execute complex behavior. This feature, along with a few tricks the scientists cooked up, permitted direct brain-wide optical inspection of neural activity. The fish had been bioengineered so that calcium flux within a neuron - an excellent proxy for impulse conduction within that cell - triggered a fluorescent signal that could be picked up and recorded via high-powered microscopy. The researchers constrained the fish’s heads by embedding each tiny animal in an agarose gel. They carved the gel away from the fish’s tail, whose movements would be key to their experiments. The more we understand the landscape of neurons that underlie a brain state like alertness, the more we understand the brain state concept itself. To test alertness, the investigators presented the fish with a visual stimulus suggestive of an approaching predator. This evokes an instinctive tail-swishing response, as the fish attempts to veer away from impending danger. Each of 34 separate larval zebrafish was subjected to repeated exposures to the looming-predator stimulus. The time elapsed between each exposure and the consequent swishing of the fish’s tail - the animal’s reaction time - was measured. In each instance, fluorescence representing activity within tens of thousands of nerve cells just prior to the stimulus was captured and recorded. The scientists went one step further in the mice: They used optogenetics - a technology, developed in Deisseroth’s lab, that allows neurons to be excited or inhibited by a pulse of light at the flick of a switch - to prove, by variously activating or inhibiting neurons in one or another population, that only a subset of the circuits in question were individually capable of increasing alertness. One was the set of neurons coming from the locus coeruleus; this set operates by secreting the substance norepinephrine. Another was an understudied group of so-called CART neurons, previously known to be responsive to cocaine and amphetamines, in a brain region called the Edinger-Westphal nucleus; and the third was a group of acetylcholine-secreting neurons in a deep-brain structure called the lateral dorsal tegmentum. 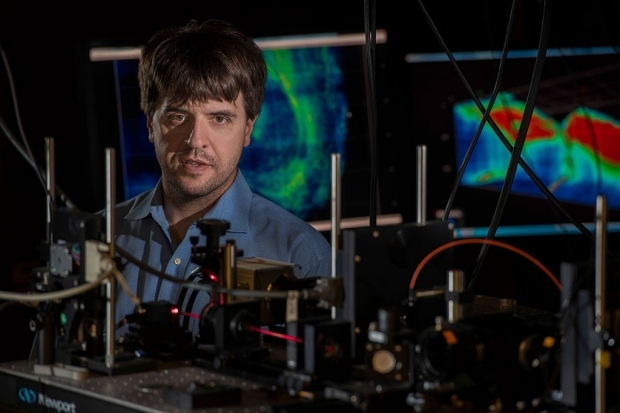 Other cell types correlated with alertness did not directly influence the behavior; Deisseroth said he thinks these neuromodulatory circuits, rather than directly triggering alertness, report on its status to other brain circuits.